The "Indian wedding" (I should say the Hindu wedding to be exact) has made the subject of numerous books, movies, visits to India. In short it’s an institution. I will try here to understand something to it! So here is how it goes – in broad lines and in general (as there are significant differences according to regions and castes). The groom must begin by making a vow of sainthood (brahmacharya) and refusing the marriage. The father of the bride must then convince him to give up this idea and to marry his daughter. The said daughter sews then 9 seeds in earthen pots in time for them to have germinated on the D day; this is the symbol of fertility in marriage. Simultaneously she invokes the goddess Gowri Devi, an icon of the ideal woman. Traditionally, the father and other males of the bride’s family go to the guy’s house and, so as to seal the deal, they apply a dot of vermilion paste on his forehead (tilak) then offer him some gifts. In return, he will send presents to his future in-laws. During the betrothal/engagement ceremony, gold rings are exchanged. During sagai, sometimes performed along with the engagement, the mother-in-law offers jewelry, clothes, make-up and baby toys. It is the time of setting the wedding date. The women on the bride’s side gather with music, dancing, gossiping and snacks. The woman (and also the man if he wants to) is covered with a paste of turmeric, chick-pea flour and water or oil, in order to be purified and have a beautiful skin on the D day. Follows the henna painting on the hands and feet (mehndi). According to some belief, the darker the henna the more the husband will love his wife; and according to the tradition, the woman should not step out of the house after the mehndi is applied and only resume housework once it has faded. We arrive finally at the point where the priest will perform his rituals. Are present on the stage the bride, the groom and their parents. The other guests are free to attend but usually enjoy their time, talking and eating. To be short, during the mandap, here is what happens: after a prayer for Ganesh, the groom is regarded as an incarnation of the God Vishnu and worshipped as such. The bride, adorned with gold, is offered by the father as a wife to Vishnu. 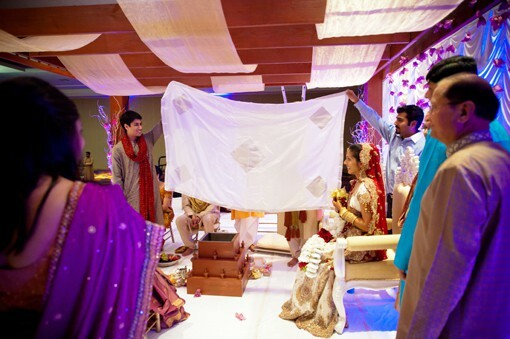 The hands of the spouses are joined to symbolize the union but they are still separated by a bed sheet and can not see each other. Over the cloth, they place on the top of each other’s head a paste made from cumin seeds and jaggery (dough having with a positive energy) and the curtain falls! The groom then tie a rope made of grass around the waist of his bride, to support her in her new responsibilities (apparently Hindus are used to tie a rope around their waist to protect their spine in the effort). 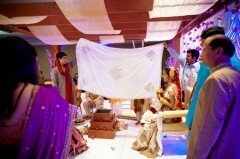 He will untie it at the end of the mandap. He passes around her neck a necklace with two pendants in gold (Mangalya), one given by the father and the other by the father-in-law. This sacred necklace represents the commitment, protection and security offered by the groom. He ties the necklace with three knots. Then the scarves of the spouses are knotted together, symbol of the eternal bond. A bit of fun then: the bride and groom spread on each other rice mixed with saffron and turmeric, before Homam, the ceremony of the Holy Fire: seven small rounds around the fire. Finally, the groom takes his wife’s left foot and places it on a stone (“be as strong as this stone and don't let the tribulations of life take you down”) and passes silver rings (mettelu) on her toes. They look at the stars together while being reminded that they must lead a life as stable as the stars. They break the fast by feeding each other. And ghee (some kind of fat) is offered to feed the fire. There are a lot of other customs, sometimes very funny: when the bride’s family steal the groom’s shoes and he has to bargain to buy them back, when the bride’s brother twists the ears of his brother-in-law to guard him against bad behavior or has to wash the groom’s feet, the fact that after walking around the fire bride has the right to sit on the left of her husband, closer to his heart, or the exchange of coconuts (symbol of fertility) between married couple in some communities etc. Once we understand the importance of marriage, not as the union of two people who are in love but as the alliance of two families who share an interest (socially, economically), we understand that people don’t go half-way for this very social event. 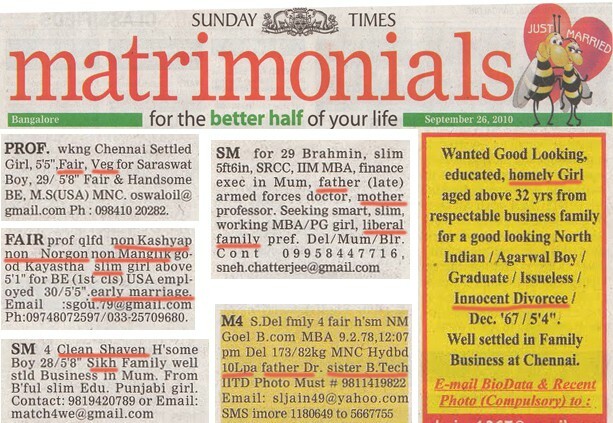 In India, more than 15 million marriages take place every year, or 300,000 on each auspicious day (in addition to individual horoscopes, Hindu can marry only on certain dates, less than 50 in the year, which creates some logistic problems, especially to rent wedding halls; for those who live above a slum (as yours truly) and are interested to know when planning a night out to avoid becoming crazy at the sounds of the drums, see this website). On the podium of the most expensive weddings in the world, the silver medal goes to Subrata Roy with a small 132 million dollars in 2004 in Lucknow (source); for the story, at the time of writing, Roy is in jail because his company, Sahara, owes $500 million to investors, and his bail is set at half this amount... That guy has missed the chance to save some money and be low profile! Between 100 and 10,000 people (on average one thousand) come to the wedding, but in general they don’t attend all the ceremonies. I have even seen posters inviting the entire neighborhood to join: this illustrates the importance of social appearances, the more guests you have the richer! (This is how Roy fed more than 100,000 beggars on the wedding day of his sons!) Remember that this is THE event of a lifetime! And it is an event of great social importance. Due to the desired lavishness and the number of ceremonies, Hindu weddings are spread over several days, between 3 and 7 in general. Hence the exorbitant cost and incredible logistics for the preparation: on each occasion they need different clothes, a buffet (in general everything is paid for the guests, including the hotel, and they even receive gifts) etc. When it is decided to put such son or such daughter on the market, the family prepare a resume and letter of motivation – I'm not kidding, my ex-boyfriend was super happy when he received a spontaneous application even though 1. He was not officially “available” for marriage and 2. He thought his reputation was ruined because he was dating a foreigner. Then they activate social networks (and here I am not speaking of facebook but of the original networks, which have incredible proportions among Indians, who are able to talk to anyone anywhere and make friends in five minutes. There is also the tradition of the nayan, the matchmaker (source) It is usually a friend or a distant relative, neutral, having a talent as a recruiter (to find the unique one) and as a negotiator (to succeed in having both parties agreeing to the “terms” of the marriage (although the dowry is illegal in India since 1961, it is commonplace that the family “buys” the guy – I gift you a nice car if (please, please, please) you marry my daughter). Today they also register on marriage websites. The family astrologer is also involved. 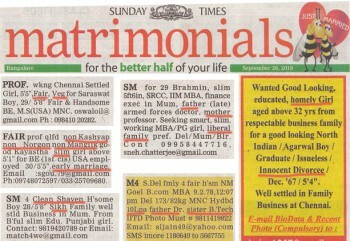 While we are at it, you should know that in India, the astrologer isn't considered as a charlatan but rather as a pillar in the life of every good Hindu: birth first, marriage then (that's why on invitation cards, the time is very precise, like 9:46 AM; is not a typo mistake but the exact time when the starts will cross path!) and then at any other important moment. For instance, one of my best managers shifted his interview for a few days, so that the planets would be aligned. So be it. Hindus even grant astrologers with the benefit of mistakes and don’t hesitate to consult several experts to get the real truth. Astrologers are also a bit magicians because when the alignment is messed up, they have the chance to correct it. So sometimes the horoscopes of a couple don’t match and the horoscope the bride predicts that her first husband will die young (she is called manglik). The trick is to marry her to a tree or an earthen pot, which then are destroyed (or immerged for the second), leaving her a widow, and free to remarry without bringing bad luck to her human husband. It has happened to some of my friends... And here's a great post by an Indian blogger on this rite (pdf) and incidentally on all her experiences as a modern dating Indian girl (blog).